REALTORS® are subject to disciplinary action and sanctions if they violate the duties imposed by the Code of Ethics. The Code of Ethics is a detailed document that spells out the professional responsibilities of every REALTOR®. Do not hesitate to ask a REALTOR® for a copy of the Code, including the Standards of Practice. The Code is your assurance of dealing with a professional who has your best interests in mind. 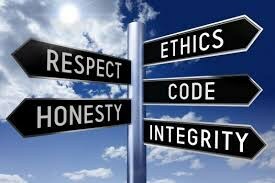 The Code of Ethics consists of seventeen Articles and related Standards of Practice. The Code can be found here. To request Ombudsman services contact the Idaho Real Estate Commission. For more information, visit NAR’s main page for Code of Ethics Training. Answers to commonly asked questions on implementing and administering the requirements can be found here. The National Association of REALTORS® created this brief, 10-minute video entitled “A Pathway to Professional Conduct: Respect Starts Here” to ensure that all members are versed on how to conduct themselves professionally in all parts of the business. It contains tips for showing respect for property, the public and your peers, reinforcing to novice and experienced members what it means to conduct business with the utmost respect. Check out the Code Kiosk, a handy resource created by the Greater Albuquerque Association of REALTORS®! This presentation, developed by REALTOR® Doreen Roberts, outlines the history of organized real estate and the development of the NAR Code of Ethics.